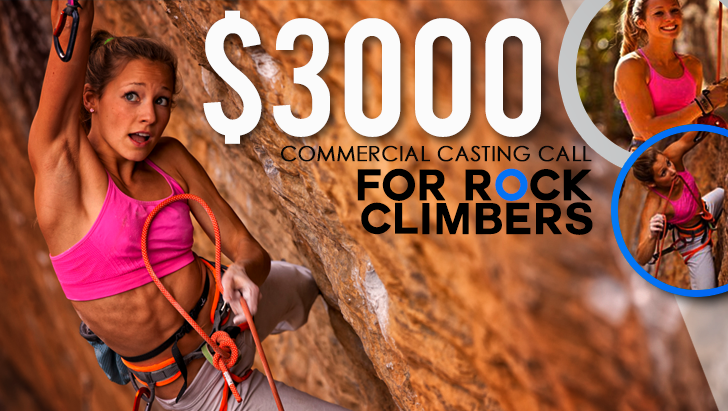 Casting directors are now seeking female talents who enjoy the sport of rock climbing to be featured in an upcoming commercial. They want 38- to 48-year-old brunette advanced rock climbers who have an athletic physique with a Latin, European, Mediterranean, Caucasian background, or a mix of any of the ethnicities. You must be able to lead climb for a scene. Production of the commercial will be held in Los Angeles, California from May 14–May 30, 205. If you are lucky to be selected, you will receive the amount of $3,000. If you fit the descriptions stated, you can click the ‘Apply for This Job’ button to send your application. Looking for talents who are Latin European, Mediterranean, Mixed or Brunette Caucasian with an athletic, gymnast-like physique. Must be able to lead climb.